West Brook's Lanard Whittington (No. 23, left) and Jerald Ardoin (No. 20, right) try to get the ball from Kingwood's Stanley Churchwell (No. 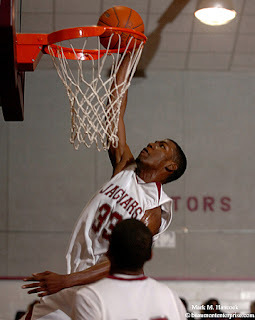 15, center) during a high school basketball game at West Brook High School in Beaumont on Tuesday, Jan. 29, 2008. West Brook's Lanard Whittington (No. 23, right) steals the ball as Kingwood's Adam Brown (No. 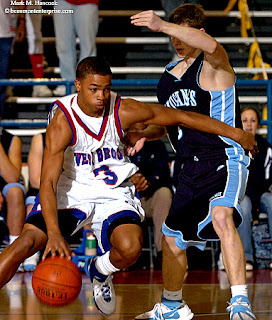 21, left) gives chase during a high school basketball game at West Brook. West Brook's Sam Griffith (No. 24, left) looks to steal the ball from Kingwood's Tevin Svihovec (No. 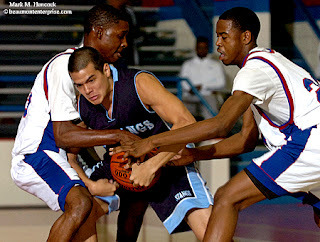 11, right) during a high school basketball game at West Brook. West Brook's Ryan Grant (No. 3, left) powers past Kingwood's Derek McLea (No. 5, right) during a high school basketball game at West Brook High School in Beaumont. Kingwood won the game 52-46 in overtime. Where is the plane of focus located? Know the answer? Take The PJ Quiz. West Brook High School junior Tanesha Simmons, 17, poses for a portrait at Weddings & More in Beaumont on Friday, Jan. 18, 2008. Simmons is wearing a champagne pick-up bubble dress with a full skirt. 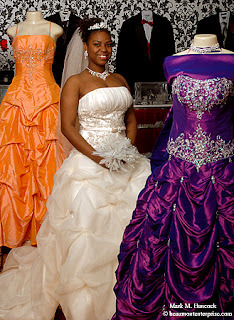 The current trend is toward colorful wedding dresses with tiaras instead of traditional wedding veils. 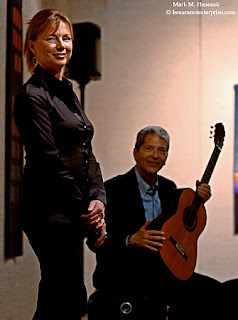 Rebecca (left) and Robert Bluestone participate in an opening reception for their work at the Stark Museum of Art in Orange on Tuesday, Jan. 22, 2008. Rebecca is a silk weaver and Robert is a guitarist. Together, they call their performance art Woven Harmony. How do PJs define tangents? 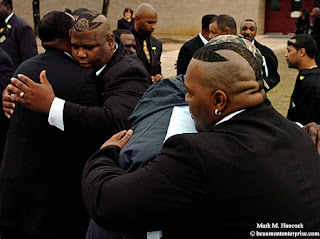 Pall bearers support each other following funeral services for two-time Super Bowl champion Ernie Holmes at Jasper High School in Jasper on Saturday, Jan. 26, 2008. Holmes was one of the NFL's greatest defensive linemen on the Pittsburgh's famed Steel Curtain. 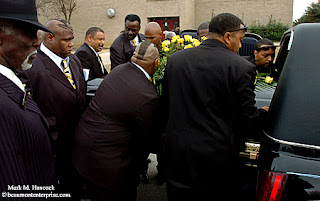 Many funeral attendees shaved their hair into the arrow Holmes wore when he played. While down in his stance, the arrow pointed at the opposing team's quarterback. Pall bearers place the casket of two-time Super Bowl champion Ernie Holmes into a hearse following funeral services at Jasper High School. Holmes died in a single-car accident near Lumberton. Please read, "Ernie Holmes went from feared to revered..." by Fred Davis. What is a photograph's skeletal structure? 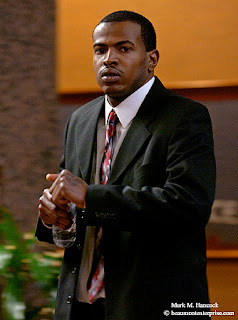 Willie James McCray moves to the courtroom before closing arguments in his trial at the Jefferson County Courthouse in Beaumont on Thursday, Jan. 24, 2008. Willie James McCray's car struck and killed Beaumont police officer Lisa Beaulieu on April 27, 2007. McCray faces up to 20 years if convicted. 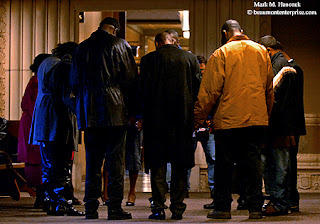 Friends and family pray with Willie James McCray as jurors deliberate his punishment in the Jefferson County Courthouse in Beaumont on Friday, Jan. 25, 2008. McCray was convicted on Thursday of intoxication manslaughter in the April 27, 2007 death of Beaumont police officer Lisa Beaulieu. McCray was sentenced to 11 years in prison. Please see Beaumont police officer Lisa Beaulieu's funeral. 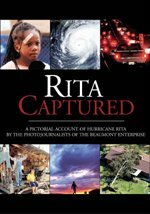 Please read the historical account, see evidence and hear the first 911 call starting with, "Willie McCray sentenced..." by Ryan Myers. This is great for most National Press Photographers Association (NPPA) members. It should save us lots of money (shipping and printing), allow our images to compete rather than layout and press reproduction, raise the bar for our work, speed the entire process, provide inspiration (and ideas) and increase association membership. I'm not certain if we'll be able to see all the entries or just the winners. If it's like the multimedia competition, this will be extra cool because we'll be able to see both the greatest and the average images each month. Because it's new, and they're a little late announcing the change, the January contest period is three-weeks. After January, it'll be due on the 7th like before. However, this is now a global deadline (instead of the way it was). I'm excited about this because it should radically improve the number and quality of contestants. I think I only entered in August last year and got 3rd for Feature / Multiple. It makes me wonder what could've happened if I competed the other 11 months. It also makes me wonder how many other NPPA members didn't enter all year (and could've easily beaten my shots). We've discussed the advantage before. But for new PJs with talent, this is the fastest way to get some pro PJ competition wins. For folks who want to become PJs, it's a fast way to see if you have what it takes. Join NPPA and enter. If you're winning, you've got it handled and can snag a job or enough gigs to keep a pizza in the freezer. I've updated the PJ Contest Calendar to include the changes. I look forward to seeing the best work from everyone each month. 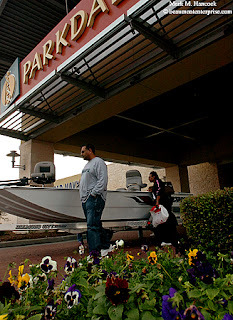 Arnold and Beverly Malveaux of Lake Charles inspect a boat during the Beaumont Boat Show at Parkdale Mall in Beaumont on Tuesday, Jan. 22, 2008. The show will continue during mall hours through Sunday. 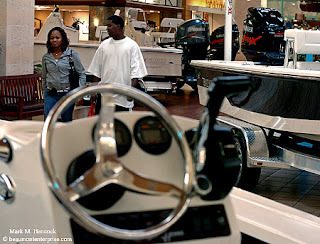 Stephanie Ross of Beaumont (left) and Stephon Ervin of Houston (right) walk through a Pete Jorgensen Marine display during the Beaumont Boat Show at Parkdale Mall. 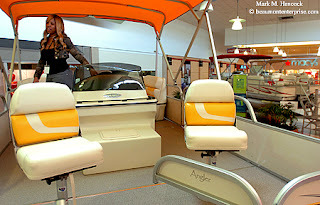 Lorretta Young of Beaumont checks out one of Pete Jorgensen Marine's pontoon boats during the Beaumont Boat Show at Parkdale Mall in Beaumont. The first presentation is mostly for non-PJs. The second presentation is for PJs. But, PJs are welcome to attend both. Then, y'all can make fun of my accent. The convention takes place on April 5-6, 2008. I'm only speaking on Friday, but I should be there through Sunday morning. So, anybody who attends is welcome to swap stories or get a critique during my "down time." I couldn't locate convention registration information, but the Web site suggests contacting Rich Hotaling, association and creative services manager. They're still getting everything settled, but they should post full details soon. Ozen High School senior Kendra "Kay Kay" Kiel (left to right), senior Danyelle Vaughn and sophomore Courtney Shilo of the trio KaDeCe' as well as West Brook freshman Taylor Cormier prepare to perform in the Rep Yo City tour at the Memorial 9th Grade Campus auditorium in Port Arthur on Thursday, Jan. 24, 2008. The students recently sang at the Apollo Theater in New York. The show aired on NBC two days later. Please watch as Courtney Shilo continues her journey. 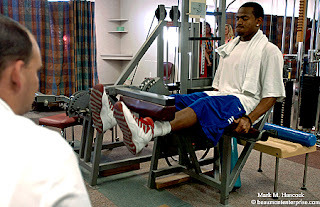 West Brook High School football player Albert Williams, Jr. (right) works to rehabilitate his knee with athletic trainer Matthew Lewis (left) at the Beaumont Bone & Joint Institute in Beaumont on Friday, Jan. 11, 2008. 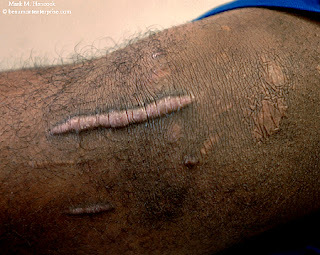 West Brook High School football player Albert Williams, Jr. has several scars on his knee as he waits on an ice pack at the Beaumont Bone & Joint Institute. Williams, a senior, had knee surgery on Nov. 2. He suffered a ligament tear Oct. 6 during a game against Kingwood. 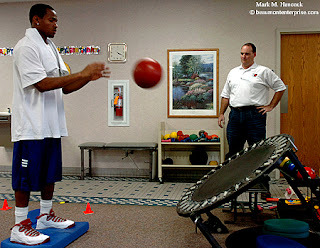 West Brook High School football player Albert Williams, Jr. (left) works on his knee strength and balance with athletic trainer Matthew Lewis (right) at the Beaumont Bone & Joint Institute. Before the injury, he was considered one of the best running backs in Texas. Please read "Williams believes scholarship offers will be there after rehab" by Chris Dabe. What is a clean image? 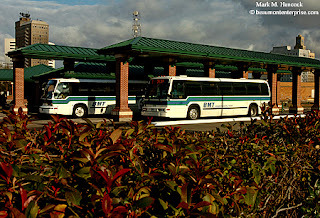 Busses wait for riders at the Dannenbaum Station in Beaumont on Wednesday, Jan. 16, 2008. The City of Beaumont is having difficulties finding a company to sell natural-gas busses to the city. Which university is currently considered the best for photojournalists? Why? 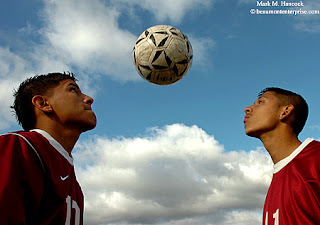 Central High School soccer players Fernando Uribe (No. 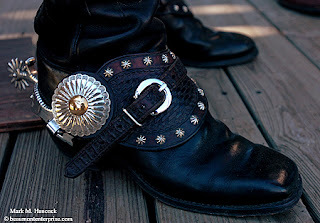 10, left) and Ernesto Alvarado (No. 11, right) pose for a portrait at the school in Beaumont on Wednesday, Jan. 16, 2008. The Enterprise hires young independent contractors to sell newspapers near busier intersections on Sundays. They're a modern continuation of the celebrated paperboy. These young entrepreneurs have decided to honorably earn money on the weekends. Most folks at the paper are very proud of these kids because they're doing something positive with their lives. They work and earn money the old-fashioned way. They stand in the rain, cold or heat to make a few bucks to help us tell the news. It's a thankless job. We're indebted to their dedication. I don't carry cash most of the time. But when I do, I'll buy a paper from these kids. Not because I need it (I get as many as I want at work), but I want to support these young businesspeople. So, I became furious when I read "15-year-old newspaper vendor beaten, robbed" on The Enterprise Web site. The story is about one good kid and three bad kids. It's also about one rockin' PJ. Guiseppe Barranco is the newest addition to the photo department. When he saw one of these young vendors get beaten and robbed in broad daylight by three other teens, he jumped into action. Guiseppe made sure the newspaper vendor was healthy and safe. Then he tracked down the thugs, called the police while he tailed them, and later gave chase on foot while police detained two of the three. It was Guiseppe's day off. He was going to the store with his girlfriend when he saw the violence. He could have continued, but he made good choices and did what was right. All it takes is one person to do the right thing to make this a better planet. My thanks go to Guiseppe. I also want to thank all the young entrepreneurs who sell our papers on Sunday. It's a rough job. Sometimes it's even worse. You're all my heroes. 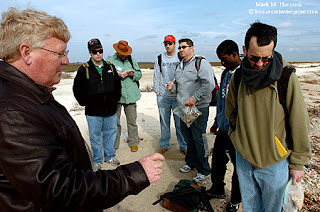 Lamar University professor Jim Westgate (left) leads a paleontology field project on a beach near Sabine Pass on Thursday, Jan. 17, 2008. Westgate opposes accreditation of an online educator's degree program through the Institute for Creation Research because of the institute's emphasis on inserting theological information into what he said should be scientific studies. 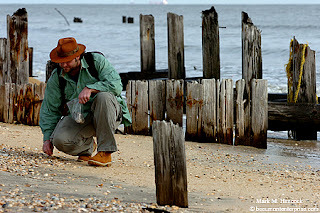 Lamar University junior James Burnes searches for diverse animal shells and bones during a field project on a beach near Sabine Pass. 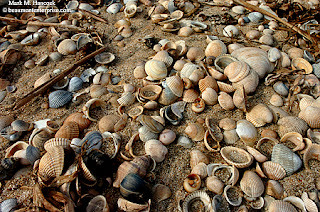 Shells on a beach near Sabine Pass are studied as a modern analogy to fossil deposits. Please read, "Science war brews" by Emily Guevara. What does the golden ratio determine? Beaumont celebrates MLK Day with a presentation at MLK Middle School and the dedication of the new Martin Luther King, Jr. Memorial Park as well as the unveiling of a statue in Dr. King's honor on the site. Please read "M.L. King statue stands tall..." by Heather Nolan. What functions does a flash card wallet perform? 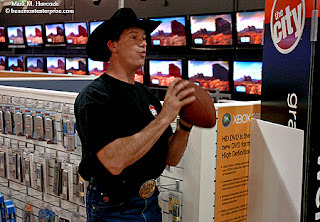 Former Dallas Cowboy Jay Novacek plays catch with employees before the grand opening of the new Circuit City Superstore near Parkdale Mall in Beaumont on Thursday, Jan. 17, 2008. Dallas Cowboy Cheerleader Whitney Ott (right) acts angered as former Dallas Cowboy Jay Novacek (left) asks for a pen during the grand opening of the new Circuit City Superstore near Parkdale Mall. 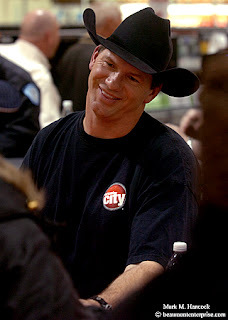 Former Dallas Cowboy Jay Novacek talks with fans during the grand opening of the new Circuit City Superstore near Parkdale Mall. Autographed balls and souvenirs were sold with the proceeds benefitting the Boys & Girls Club of Beaumont. Former Dallas Cowboy Jay Novacek (from left to right) as well as Dallas Cowboy Cheerleaders Whitney Ott and Laura Beke sign autographs for fans during the grand opening of the new Circuit City Superstore. Rayshawn Morris, 7, of Beaumont (center) finds it difficult to remember how to spell his name while speaking to Dallas Cowboy Cheerleaders Whitney Ott (left) and Laura Beke (right) during the grand opening of the new Circuit City Superstore in Beaumont. What is one of the easiest and cheapest pieces of equipment to improve image quality? 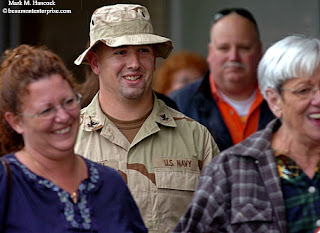 Petty Officer 2nd Class Jason Dillon is surrounded by his family as he arrives at the Southeast Texas Regional Airport. Dillon is on leave for 30 days following his service with the U.S. Navy in Iraq. 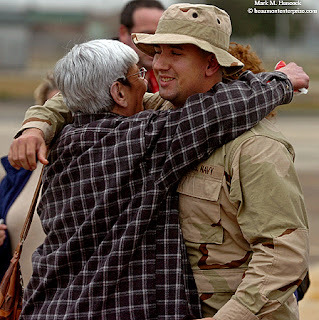 Violet Dillon (left) hugs her grandson Petty Officer 2nd Class Jason Dillon (right) as he arrives at the Southeast Texas Regional Airport on Tuesday, Jan. 15, 2007. 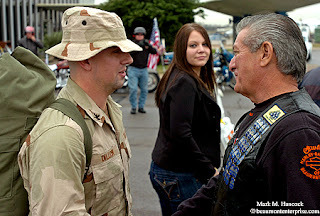 Petty Officer 2nd Class Jason Dillon (left) is thanked for his service by Patriot Guard rider Louis Stanley (right) as Shelly Sponsler, Dillon's sister (center), watches at the Southeast Texas Regional Airport. Who is responsible for the actions of a photographer? 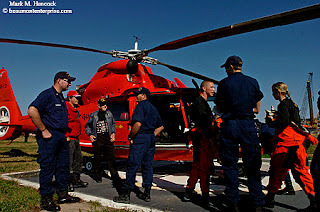 Coast Guard members and guests gather around a rescue helicopter during a Coast Guard training day at the U.S. Coast Guard Station Sabine in Sabine Pass on Saturday, Jan. 12, 2008. Auxiliary members and potential members observed and participated. 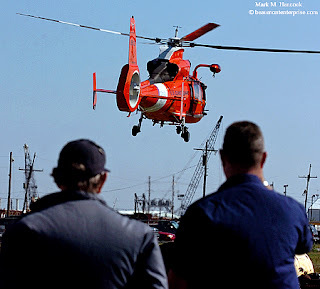 Retired WWII veteran Lee Timaeus (left) and active duty Chief Petty Officer James Elsenburg (right) watch as a helicopter lifts off during a Coast Guard training day at the U.S. Coast Guard Station Sabine in Sabine Pass. Timaeus plans to join the ausiliary. As stated before, the "Came From" stats got messy in October. I've kept an eye on the stats and haven't seen a sufficient uptick from any other privately-owned blog. If anyone thinks they referred enough visitors to usurp Bryon Houlgrave's blog, you have two weeks to let me know. Otherwise, he'll be declared the referrer champion. The Motiva refinery plant reflects off a commemorative shovel during the ground-breaking ceremony for the Motiva refinery expansion in Port Arthur on Monday, Dec. 10, 2007. The $7 billion expansion will increase the refinery's capacity to be the largest in the United States. 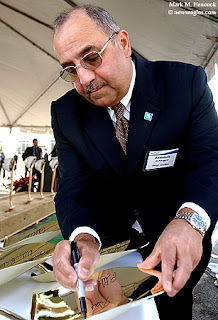 Abdulaziz F. Al-Khayyal, senior vice president of industrial relations for Saudi Aramco, signs commemorative shovels during the ground-breaking ceremony for the Motiva refinery expansion in Port Arthur. The project is funded by Shell and Saudi Aramco. Work continues at the existing Motiva plant during the ground-breaking ceremony for the Motiva refinery expansion. This is the single largest capital investment in the history of Texas. 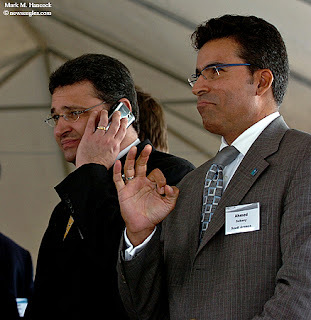 Ziad Labban of Saudi Refining (left) talks on a phone while Ahmed Subaey of Saudi Aramco (right) encourages another executive during the ground-breaking ceremony for the Motiva refinery expansion in Port Arthur. 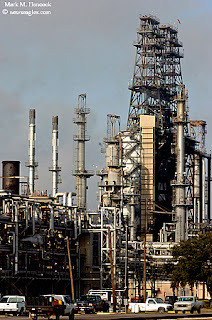 Please read "Foreign oil companies building Texas-size refinery..." by Elizabeth Souder and Jim Landers. Which type of light meter reading is most accurate? Central's Lincoln Charleston takes the ball to the hoop during a high school basketball game at Central High School on Friday, Jan. 11, 2008. Central is relatively close to the office. The game started later than most, so I planned to shoot it, split and turn it out at the office. When I got to the truck, I found some jerks (more than one) had parked in the exit lanes. My truck was trapped. Ten years ago, it would have been a major crisis. Anymore, it's an annoyance. I went back to my parking spot, pulled out the laptop and transmitted via a broadband card. Some PJs may yearn for the "good old days." However, it's all good. I didn't need a darkroom or a phone line. I could have edited and transmitted a video if it was needed. It may not be old, but it seems pretty good to me. What are four of the eight major fields of photography? 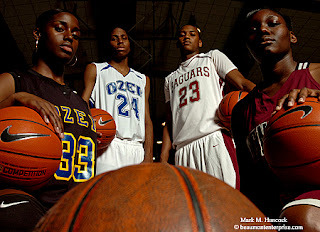 Basketball players Adrienne Minor (from left to right) and Jacoby Joseph from Ozen and Jarmar Gulley and Katrina Harris from Central pose for a portrait in Beaumont on Thursday, Jan. 10, 2008. The teams will tip off against each other on Friday. 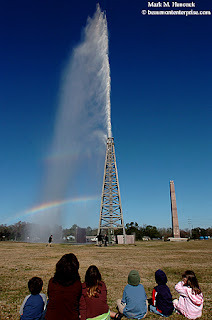 A rainbow forms in the water spray during a reenactment of the Lucas gusher during the Spindletop-Gladys City Boomtown Museum Grand Re-opening on Saturday, Jan. 12, 2008. 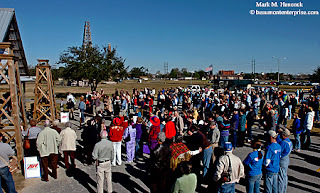 Celebrants listen to opening remarks during the Spindletop-Gladys City Boomtown Museum Grand Re-opening. The museum was badly damaged during Hurricane Rita. J.C. Verde of Port Arthur looks authentic down to his boots during the Spindletop-Gladys City Boomtown Museum Grand Re-opening. 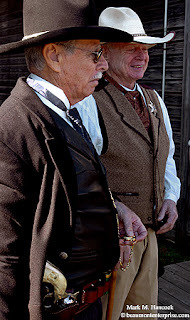 J.C. Verde of Port Arthur (left) and Harlan Walker of Beaumont (right) keep the peace during the Spindletop-Gladys City Boomtown Museum Grand Re-opening. The Spindletop-Gladys City Boomtown Museum held a grand reopening of the facility on Saturday, Jan. 12, 2007. The museum emulates the 1901 roughneck town where the first oil gusher was found in modern Beaumont, Texas. The video shows a reenactment of the famous Lucas gusher. What's the most important part of a camera system? 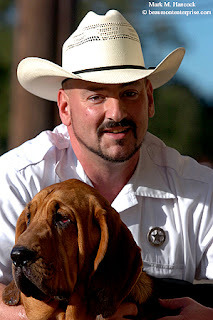 Annie, a 10-month-old bloodhound (bottom), sniffs downtown air with handler Kevin Pierce, a criminal investigator for the Texas Forest Service, during an event at the Texas Fire Museum in Beaumont on Thursday, Jan. 10, 2008. Annie was trained to track down arsonists for the Texas Forest Service. 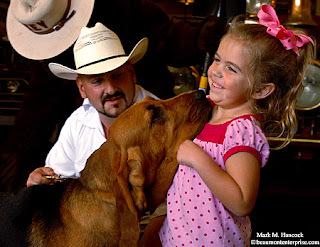 Annie, a 10-month-old bloodhound (center), gives a kiss to Elizabeth Lee, 6, of Sour Lake under the watchful eye of handler Kevin Pierce (left) during an event at the Texas Fire Museum. Annie is Texas' first arson canine. 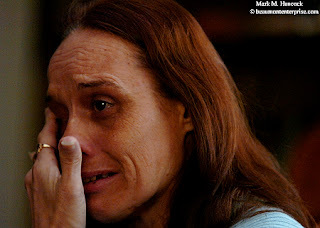 Peggy Britton cries while talking about her ordeal at a friend's home in Vidor on Thursday, Jan. 10, 2008. Britton was seriously injured while her boyfriend died in a motorcycle wreck on I-10 in Vidor on Sept. 21, 2007. A benefit to help Britton, who can no longer work due to the injuries she suffered, will be held at the Bayou Club in Orange on Saturday. Please read, "Woman who survived motorcycle wreck struggles..." by Mike D. Smith. What does a tripod prevent? 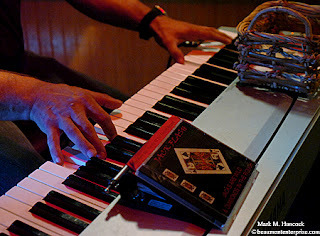 Jack Flash the Piano Man (Jack Sewell) performs at Tuffy's Eatery in Mauriceville on Tuesday, July 24, 2007. He plays songs requested by the audience as well as original work. 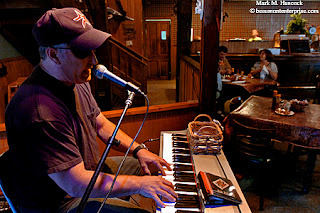 Jack Flash the Piano Man (Jack Sewell) performs at Tuffy's Eatery in Mauriceville. His hope to become a Nashville star was sidelined after he lost an eye during a barroom brawl in Pasadena, Texas. Please read, "Heart and soul of a musician" by Robert Lopez. In the story, he gives insight into what PJs should strive to achive as well. "People don't go home and talk about what they heard," he said. "They go home and talk about what they felt. You've got to touch their hearts." 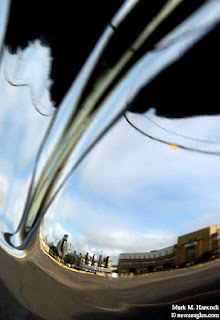 What does a PJ see through the viewfinder when s/he squeezes the shutter release button? 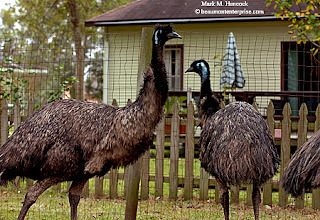 Godfrey Choate legally keeps four emus behind his home in Beaumont's Tyrrell Park area on Wednesday, Nov. 8, 2007. Some city residents with enough land are able to legally keep livestock on their property. From a PJ's position, what angle and direction should a shadow lay for most assignments? 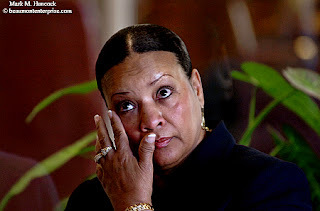 Virginia Bean, wife of the late Sam Bean, wipes away a tear during a renovation celebration at the Raintree Towers in Beaumont on Thursday, Nov. 15, 2007. Sam Bean was vice president of Raintree's board of directors during most of the 15 years he served. 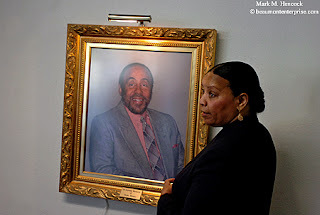 Virginia Bean examines a portrait of her late husband after a renovation celebration at the Raintree Towers. The Beaumont Elderly & Handicapped Housing Corporation refinanced the property for about $1 million to make significant repairs to the facility. As part of the renovation ceremony, a portrait of former board vice president Sam Bean was added to the towers' lobby. Please read, "Civil rights leader honored" by Fred Davis. What happened to the delivery speed of PJ work during the last 10 years? 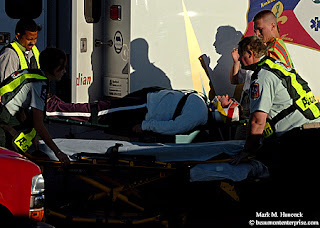 Emergency workers evacuate an injured person after a minivan ran into the back of a Vidor ISD bus on Main Street in Vidor on Thursday, Dec. 20, 2007.